CPU cooling is a key aspect of running an efficient system. Processors produce heat; understand CPU fan speed, CPU overheating, CPU heatsink review, computer tower cases, and more to cool your system. CPU Cooling - the process of removing excess heat from the processor. Computer components - especially the CPU - produce a ton of heat. CPU overheating: left alone, your CPU will quickly burn itself out, causing a lot of heartache, and costing you a lot of money. An entire industry has sprung up around cooling. We're going to take a look here at heat sinks, cooling fans and CPU fan speeds. At the lowest level of processor cooling, we have heat sinks. By themselves, heat sinks have the ability to remove excess heat from the CPU. Add in a CPU cooling fan, and you can keep your CPU nice and cool, even when overclocking. So let's examine a heat sink. A heat sink works by transferring heat away from the CPU with high heat, to the heat sink with lower heat, but with a higher heat capacity. This heat transfer lowers the CPU temperature, and raises the heat sink temperature. 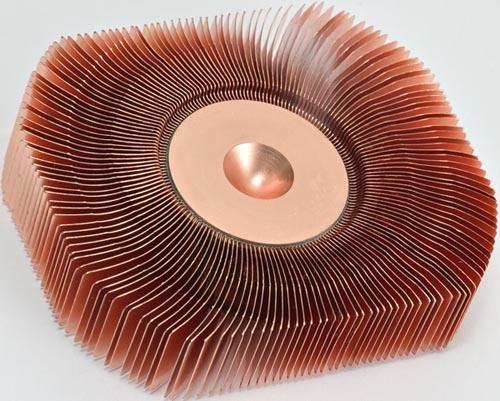 The most common design of a heat sink is a block that maintains contact with the CPU which leads to many "fins". These fins have a large surface area, and are above the CPU, in the cooler air of the computer case. This cool air dissipates the heat from the fins quickly, which allows them to draw more heat from the block. This is a continuous cycle, the block drawing heat from the CPU, the fins drawing the heat from the block and dissipating it into the case. In order to draw heat, the heat sink needs to maintain a tight connection to the CPU. CPU blocks and the CPU itself are never perfectly flat. In order to maintain the connection needed for better heat transfer, you will use a thermal compound. You will notice on stock heat sinks that are included with your CPU, a gray tacky material on the bottom. This is one type of thermal compound. This is designed so that the first time you heat up your CPU, it will "melt" the compound and allow it to spread out over the surface of the CPU. If you purchase an after-market heat sink, make sure thermal compound comes with it, or pick up a small tube at the computer store. The best thermal compounds will have silver integrated into the paste. Silver has a very high conductivity, even higher than copper. When you apply the paste to your CPU, all you will need is a thin even layer. Over time, this layer will set in, and attain even better contact to provide better CPU cooling. Most heat sinks that are included with today's CPU's are made from aluminum. Aluminum conducts heat well and is very easy to work with. This makes it an inexpensive solution for cooling. However, once you start overclocking your CPU, you are going to need a better material. This is where copper comes in. Copper conducts heat at roughly twice the rate of aluminum. Being that it is harder to work with, it will cost you a bit more. With overclocking however, you may need the increased performance. Thermaltake - Thermaltake has been around for some time. Their heatsinks range in price from around $13.00 to $70.00. Zalman - Zalman is another company that has been around. Their heatsinks will range from $24.00 to around $70.00. Thermalright - I am currently using a Thermalright heat sink and I have to say that it is doing a great job. Thermalright's heat sinks range from $15.00 to around $60.00. Combined with a good heat sink is airflow. A heat sink will cool your CPU on its own, but having good airflow will greatly increase the rate at which it can cool your processor. You will always see a fan attached to today's stock heat sinks. This fan is usually attached to the top of the heat sink's fins, and pulls the hot air up and away from the CPU. But a bit more is needed. 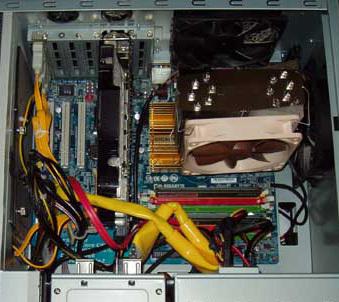 If you simply blow that hot air into the computer case, you will raise the ambient temperature inside the case, and make it harder for the heat sink to dissipate the heat. Computer cases are equipped with at least one fan, but the more you can get in, the better your cooling will work. In this picture, you can see the CPU cooling fan connected to the heat sink. This fan will blow air through the heat sink, to the back of the case where is is pulled out by the case fan. Also, what is not shown here is a large fan in the front of the case that pulls in air from the outside and pushes it over the heat sink for even better cooling. Computer case fans come in many shapes and sizes. They are measured in millimeters. The most common size for a case is 80mm. 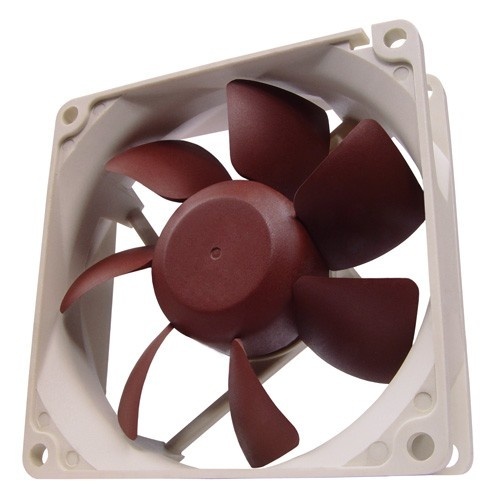 A lot of cases recently are trending toward 120mm fans. These allow more airflow and are usually quieter. The general rule of thumb is the bigger the better. Larger fans can rotate at slower speeds while still achieving greater CFM ratings and allow for quieter operation. CFM is Cubic Feet per Minute and is used to measure how much air the fan is moving. The higher the rating, the more air the fan will move. The other thing to keep in mind is the noise level of the fan. Noisy fans can be quite irritating, especially when you have 2, 3 or more in your computer case. The major contributors to fan noise is the speed of rotation and the type of bearing that it uses. There are two main types of fan bearings; ball bearings and sleeve bearings. Ball bearings can be noisier than sleeve, but will normally last longer. Noctua - These fans use what is called a self stabilizing oil-pressure bearing. These are magnetically centered and are super quiet. A good 120 mm fan will run you around $20.00. Papst - These fans are the sleeve bearing type, and are also super quiet. A good 80mm Papst fan will run you around $17.00. Zalman - Zalman is a top name in computer and CPU cooling. Their fans are able to run in two speeds, Silent or Normal. Silent is just that, quiet operation. Normal will speed the fan up for a higher amount of CPU cooling, but will get a bit noisier. Even then however, they are not all that loud. 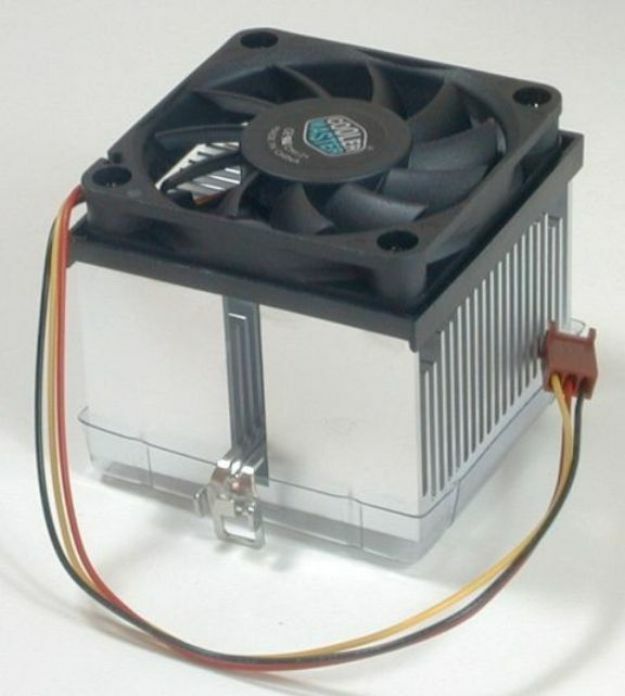 A Zalman 80mm fan will run you around $5.00. Heat Sink Block - The bottom of the heat sink should be smooth and even. This is the connection between the CPU and the heat sink, so it will need to maintain a tight connection. The smoother and more even the heat sink is, the better the contact will be. Aerodynamics - The heat sink should be designed in such a way as to allow airflow around the fins. Too small of a distance between fins will reduce the airflow, and thus the cooling capabilities. Too large of a distance and you may not be dissipating enough heat. Heat Transfer - The link between the heat sink block and the fins should be able to conduct heat quickly, and in large amounts. Many of the higher end heat sinks today will use pipes to transfer the heat from the block to the fins. The material used to craft the heat sink will also help. Copper will conduct heat about twice as fast as aluminum. Mounting - The higher end heat sinks can get quite large, and weigh over a pound. These heat sinks require special mounting brackets around the CPU to keep the weight off of the CPU. At the same time, they must maintain a close tight connection to allow for better CPU cooling. Fit - With the large size of some heat sinks, ensure that they will fit in your computer case (often computer tower cases provide the best-fit options due to their size). Check out CPU heatsink reviews; they can provide good feedback and information on the best cooling available for your system.